Article is devoted to research of a perspective of influence of ways of kovshevy modifying on a microstructure constructional alloys the otlivka of a difficult configuration of centrifugal pumps intended for production. In work results of the original pilot studies which carried out in 2006…2008 at leading machine building plant Russian Federation and have passed industrial approbation are presented. Keywords:Modifying, microstructure, alloys. Work is dedicated to study influence of nanodispersed particles by ash alumina on structurization water suspensions bentonit clays. The Explored action nanodispersed hydrosols and organocserogel oxides alumina on characteristic modified nanosol bentonit clays. It is analysed dependency of modifying bentonit to compositions from the type an nanosol, influences of the electromagnetic field. Key words: nanodispersed particles, hydrosol oxides aluminum, water suspensions bentonit clays, structures by ash, electromagnetic field. It is not always that foundrymen know casting defects. For effectively revealing defect varieties, stages of their formation and elimination methods they must be analyzed. There are presented ideas of defect origination dynamics and methods of their elimination. Key words: casting, technology, defects, gas bowls, shrinkable bowls, cracks. Cryotechnology of casting of ferrous and nonferrous metals using ice patterns can be eliminated from foundry organic materials. This increases the ecological safety of production, reduces the cost of casting and promotes problem-solving resource. Keywords: Cryotechnology, ice pattern, filtration molding, shell mold, casting, nonorganic materials, metal. 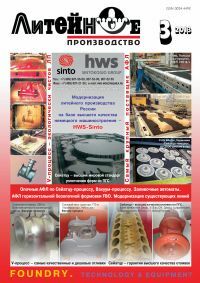 The article is dedicated to the technology of making large-size castings from VKNA1V intermetallide alloy on a directional solidification unit UVNK15. There have been conducted experimental melts that showed the functionability of the unit, and problems have been set that are to be solved in improving the unit. Key words: units and technologies for directional solidification, microstructure, macrostructure.